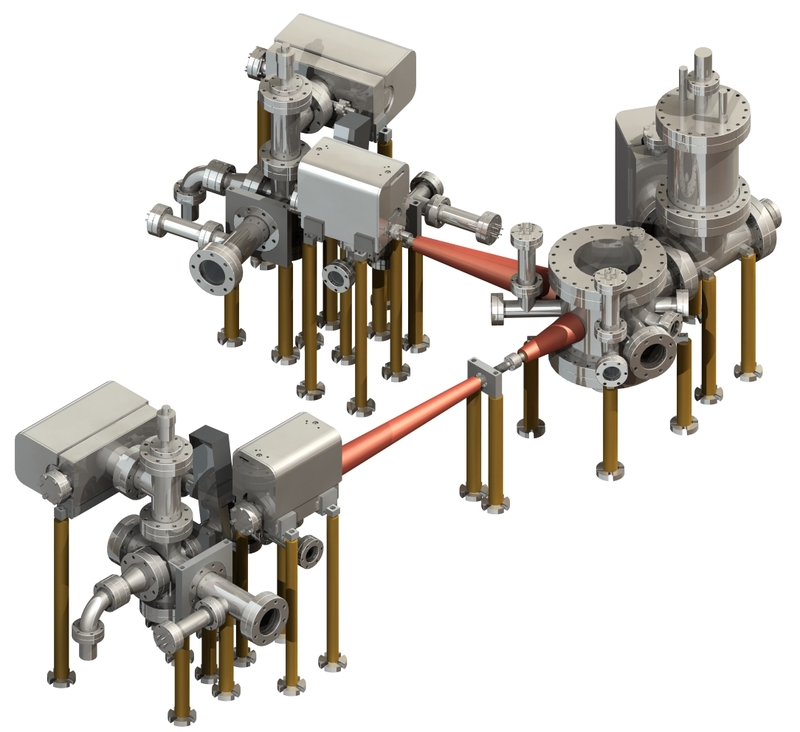 The illustration below is of the two-species vacuum chamber apparatus for cooling lithium and ytterbium atoms, as it is currently being constructed. The ovens which hold the atom samples are seen as the pipe tails on the upper and lower left of the image, and the red conical sections are the Zeeman slowers, which utilize magnetic fields in order to maintain the frequency absorption of the atoms as their speeds are slowed and Doppler shifting takes place. After passing through the Zeeman slowers the atoms arrive at the main chamber, and have been slowed to milli-Kelvin temperatures. Here they become captured in the dual magnetooptical trap (MOT), in which a large magnetic field combined with crossed lasers tuned precisely to resonate with the atoms hold them in place. After evaporative cooling to a condensate state, the sample will be imaged by a camera system above and below the main chamber.